Instead of carry a handgun, you can bring a knife on your self-defense tool list. Although there are many knives available out there on the market, Gerber Paraframe is one of the most popular knives with fixed blades included. 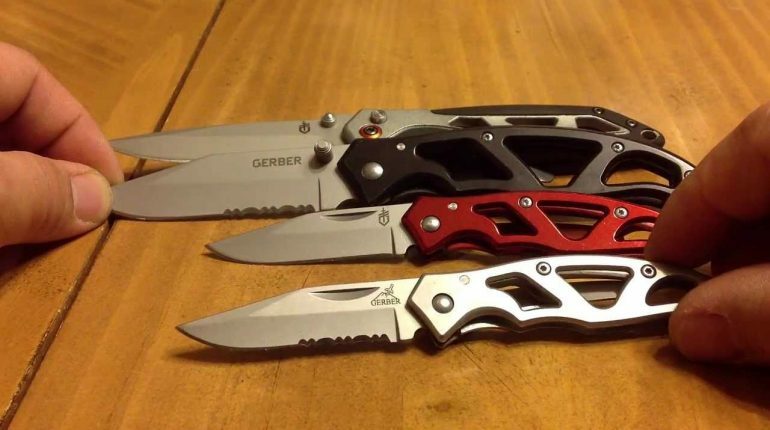 Gerber Paraframe has two models – the first and the second version. Each model has the similar and different features that we need to find out. Keep on reading to get your own answers. Gerber Paraframe 1 has a three in one clip point blade designed of high-quality stainless steel. In fact, the entire blade of this knife is made of the stainless steel. In general, the edge blade and jagged edge are well-made, but you should check the state before purchasing and using it. With the blade, it is made from 400 Series stainless steel so that there is no doubt about the sharpness of the knife blade. The handle is created from 314-grade stainless steel. However, the handle is still lightweight enough for all users to carry and control the whole knife easily. Generally speaking, this knife has a solid construction to withstand any obstacle and the weather condition. The Frame Lock is a special unique locking system in Gerber Paraframe 1. Please recognize that it is not a Liner Lock feature that you may see in other products. On the one hand, this version has other features such as the dual thumb lumps for ease of setup with one hand and a pocket clip. The pocket clip cannot interchange but it is still sturdy so that the entire knife is also very firm. The blade slightly moves when pulled sideways, back and forth in the open and close movement. In other words, the Frame Lock keeps the lock in the open position carefully. You might be surprised at the sharpness of the blade. Catch the blade and do that what it is called a wiggle test. The blade size is 3 inch which is an ideal for working, but it still small enough to carry wherever you want to. Even if the knife does not include a sheath, you could keep it in your pocket or small space without any problem at all. With the weight, you might be surprised that it weighs only 2.7 ounces, so there is no doubt that users cannot take it when necessary. Gerber Paraframe 2 is the largest of the eight knives in the Paraframe series, it is designed on the same minimal frame-lock model. It is a great simple open-frame knife with a serrated locking mechanism. With the blade and the handle position, they are also made of the stainless steel. Moreover, the liner and the frame also are incorporated into the steel. In other words, stainless steel is the best materials for a folding knife like the Gerber Paraframe 2 to build a sturdy frame. 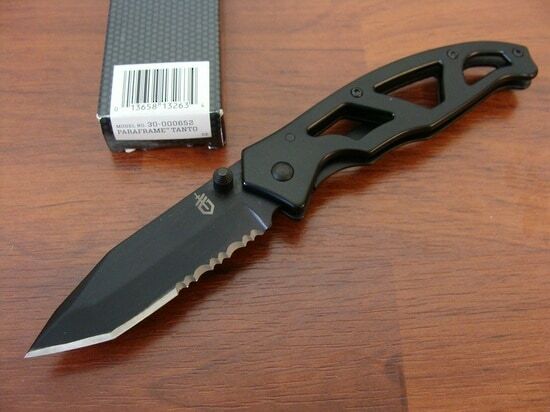 Like the first version, Gerber Paraframe 2 has the Frame Lock which is a sturdy locking mechanism for a pocket knife. This knife has a tip-down pocket clip and a thumb stud for ease of setup and holding while using. The blade is quite sharp to trim and cut your targets easily and smoothly. Undertake a wiggle test is easier by reaching the blade and begin your needs. When looking at size and weight of the blade, you will know the reason why this version is lightweight and long enough on hand. The blade length is only 3.50 inches, and it weighs about 4 oz. to be suited a decent pocket knife. Although you may not see the difference between Gerber Paraframe 1 and 2, they still have some small points to feel. When holding both of them in your hands, you are able to feel the second version is longer and larger than the first one. Because Paraframe 2 has a larger handle than the first model. On the one hand, version II is heavier with 4.3 ounces than 2.7 ounces in the first Paraframe. Even if it is heavier, it is still not a bulky knife to carry. The thumb position is quite different. The first has the dual thumb lumps while the second has the thumb stud. Both of these features also help users take the knife easily. Additionally, the blade type of the first version is Partially Serrated while the second model is Tanto. Gerber Paraframe brand displayed a simple, reliable, and easily carried knives for everyone. Whether you choose the first version or the second, you will have a true investment for purchasing a self-defense tool for outdoor activities or just normal days. Why do not you buy a tactical knife like these products right now?